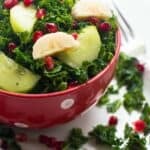 Curly kale fruit salad – incorporate some dark leafy greens into your diet with this kale, banana and pomegranate fruit salad recipe. The summertime was truly amazing, we frolicked, ate an amass of exotic fruit, removed the cob webs from the blender to make awesome smoothies, and we chomped on salad while basking in the scotching sun. Now it’s time to retreat, let’s put away that skimpy outfit, kiss good bye to that bikini and fella’s say good riddance to that tank top which all the ladies admired. I don’t think so, okay….I was adding some light humour to the body of my post because it has been raining cats, dogs and a couple of rabbits over here. The cooler months in the UK are quite strange, we go through episodes of gale force winds, monsoon type rain and snow fall which causes complete chaos. I’m sad to announce that summer is officially over, bye bye summer it was a pleasure knowing you, see you next year. In hindsight, my summer was amazing, this year was first time blogging during the summer which was a great experience. Next year will have a different concept and feel, I already know it. I hope you guys stay with me for the long haul, I have so much to share with you all and some support from yourselves really drives my determination I digress. The true be told is that I never stopped eating salad, why should I? they’re low in fat (depending on what you pair it with) light on the tummy and incredibly tasty. Another fact about me – I LOVE KALE…..I’m not kidding you I eat kale almost everyday. Atleast one of my main meals will have kale or a side serving of kale. Right now kale has gained quite a notoriety, as A list celebrities are endorsing it to no end. Kale is a dark leafy vegetable packed with endless amounts of vitamin and minerals – perfect for nourishing the body internally as well as externally. In particular, vitamin k a fat soluble vitamin most noted for it’s important role in blood clotting. Although the clotting of blood can sometimes be a bad thing, in the case of blocking a vein or artery, we need blood to coagulant to stop us from loosing a lot blood during an injury. This thickening of blood decreases the likelihood of pathogens entering the body. Kale is also filled with antioxidants like carotenoids and flavonoids, essential for warding off an array of cancers. It’s also an antiflammatory superfood making it an idea food to consume typically if you suffer from an autoimmune disorder like eczema, acne, psoriasis, lupus or asthma just to name a few. 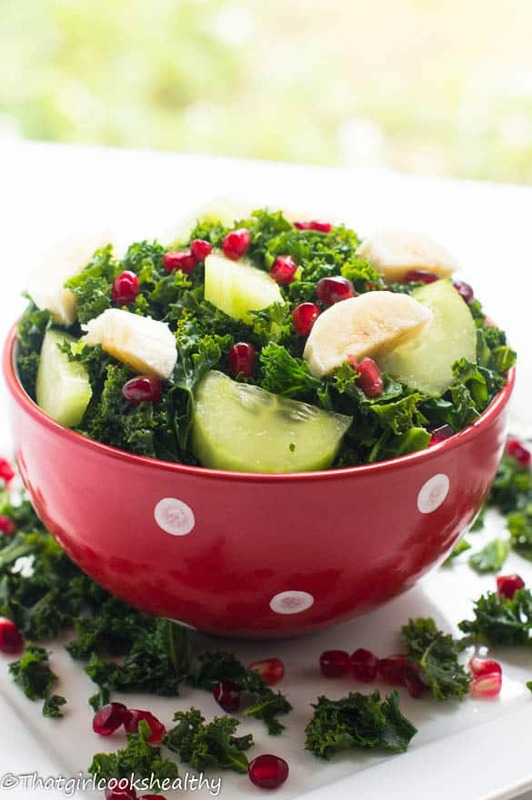 Aside from the kale as you bite into the salad, you’ll crunch on the pomegranate seeds – the sweetness from the banana and coconut topping will sensationalise your taste buds and the cucumber gives a light water content with a subtle crunch. 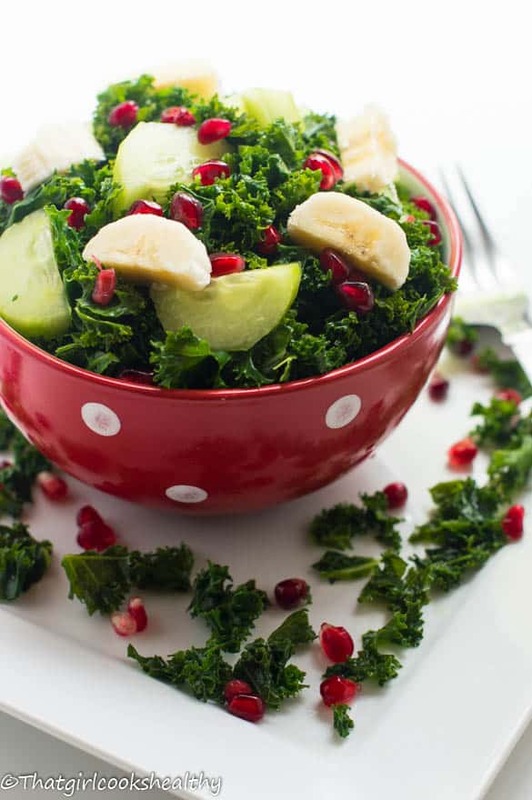 What are you waiting for, let’s get kale-ing with this curly kale fruit salad! A bunch of kale (roughly 4 cups), chopped with stem removed. 1/3 cup of pomegranate seeds. 1/3 of cup cucumber, chopped and peeled. Under low heat, Wilt the kale by steaming it for under 5 minutes in a sauce pan with water. Drain off the excess water and transfer the kale into a bowl – this will serve as the foundation for the salad. 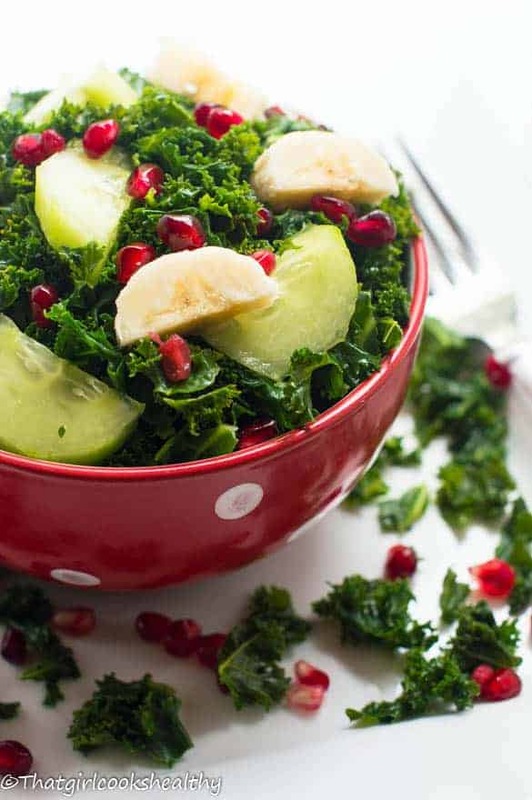 Arrange the pomegranate seeds, banana, and cucumber on top of the kale. Finish off by garnishing with optional shredded coconut.